As of the end of 2016, 97 out of 167 countries (58%) with populations of at least 500,000 were democracies, and only 21 (13%) were autocracies, both post-World War II records. The rest either exhibited elements of both democracy and autocracy (26%) or were not rated. 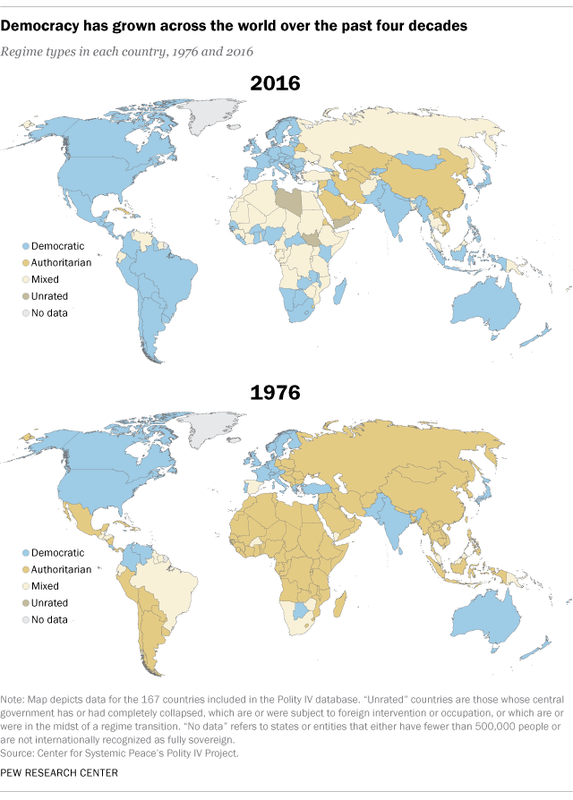 Broadly speaking, the share of democracies among the world’s governments has been on an upward trend since the mid-1970s. To track the spread of democracy around the globe, we used the ratings contained in the Center for Systemic Peace’s Polity IV dataset. Polity is a widely used resource in political science that analyzes and codes how political authority is gained and used in every fully independent state with a population of 500,000 or more (167 of the world’s 200 or so sovereign states in the current version). Polity assesses six key factors, from openness of political participation to constraints on the chief executive, to place each country on a 21-point scale ranging from +10 (“consolidated democracy”) to –10 (“hereditary monarchy”). Polity doesn’t rate countries whose central government has completely collapsed, those that are subject to foreign intervention or occupation, or those in the midst of a regime transition; there were five such countries in 2016. Following the Polity guidelines, we categorized all countries scoring from +6 to +10 as democracies, those from –6 to –10 as autocracies and everything in between as “mixed.” We then tracked the changing prevalence of democracy and autocracy in the seven decades since the end of the Second World War. In 2016, 33 countries were considered fully consolidated democracies, with a Polity rating of +10. However, that was two countries fewer than in 2006, the peak postwar year for consolidated democracies. In 1977, only 35 of the 143 countries rated by Polity (24%) qualified as democracies, while 89 (62%) were classified as autocracies of one stripe or another (including nine absolute hereditary monarchies). Although the number of democracies began edging higher in subsequent years and the number of autocracies gradually fell, half of the Polity-rated countries were still considered autocracies as late as 1988. But democracy spread rapidly as the Soviet-led bloc, and then the Soviet Union itself, crumbled between 1989 and 1991. Only 15 of the 72 countries rated as autocracies in 1988 were still rated this way in 2016; 25 had become democracies, and most of the rest had mixed ratings. (Two, Haiti and Libya, were not rated because of regime instability; four others had ceased to exist.) Among the 30 new nations formed since 1988, 17 were rated as democracies in 2016, six were autocracies, four were mixed and three were not rated due to instability or foreign intervention. Polity’s democracy ratings are by no means the only ones out there, though because of differing methodologies they tell somewhat different stories. Freedom House, for instance, rates 87 out of 195 countries (45%) as “free,” using criteria that include both political and civil rights. And though nearly half of the 165 countries in the Economist Intelligence Unit’s Democracy Index are democracies of one sort or another, only 19 are considered “full democracies” – seven fewer than in 2006. 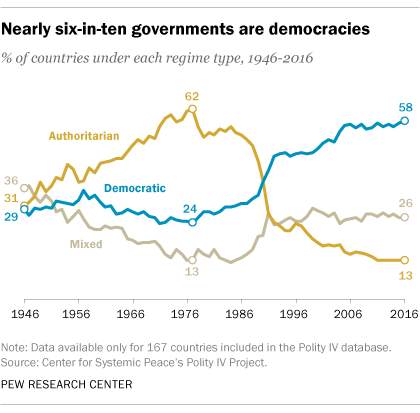 The Pew Research survey found that majorities in each of the 38 countries polled consider representative democracy a very or somewhat good way to govern their country; majorities in nearly all of the surveyed countries said the same thing about direct democracy. But nondemocratic alternatives also had support: Across the surveyed countries, a median of 49% said governance by experts would be a good way to run their nation; the corresponding figures for military rule and rule by a strong, unconstrained executive were 24% and 26%, respectively.